What to do with your waste and recycling if you live in a house, maisonette or flat in a converted house. You can download and print our printable recycling guide (pdf, 873 KB) to put on your fridge. You should leave your waste and recycling ready for collection from 8pm the night before and no later than 6am on your collection day. If there is space at the front boundary of your property you should leave your sacks or bins there. If there is not space, you can put your waste on the pavement in sacks. Some properties are not eligible for kerbside recycling. These are typically flats above shops or properties without any curtilage. Residents should recycle using the containers provided. We provide blue and black boxes for recycling as well as special containers for recycling food waste. If you do not have these already, please order your recycling containers. 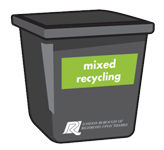 Do not overfill your recycling boxes as it makes them difficult to carry and may result in wind blown litter or non-collection. If you regularly struggle to fit all your recycling in the boxes provided, please order further boxes, or purchase net covers for them to prevent items blowing out. View our list of recyclable items to find out where you can recycle them. Your blue box is for mixed paper and cardboard. 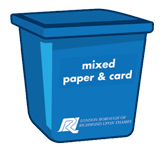 Please place all clean paper, card and cardboard in your blue recycling box. Larger pieces of cardboard should be broken down until they fit. Alternatively, they can be flattened, tied in a bundle (using non-nylon string) and placed next to or under your blue box. Your black box is for plastics, cans and bottles. Please rinse to keep items free of significant food remains. Squash soft containers and replace lids after rinsing as this helps fit more in the box. However, any pump action mechanisms should be removed and placed in your dustbin. Use your kitchen caddy to store food waste in your kitchen and then decant into your large green food waste container. We recommend that you purchase dustbins with clip-on lids if you have suitable external space to store them. If not, rubbish should be left in tied, un-split black refuse sacks.